So what exactly is patellofemoral pain syndrome? Well it is rather simple. This is a problem where the knee cap does not track properly up and down a grove in the femur. Normally the patella or knee cap smoothly rides up and down in the trochlear groove of the femur when you walk, run, hike, bike, etc. So if the knee cap does not track properly then the underneath of the patella experiences an usual amount of stress causing uneven wear and tear. The simplest analogy I can give is that this problem is like the front end of your car being out of alignment. When this happens the tires will wear uneven. This is exactly what is happening to the knee cap. 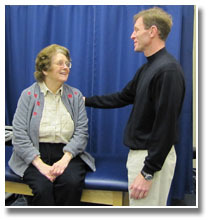 The symptoms are complaints of pain in and around the knee when you are active, walking, running, hiking, biking, etc. So ok what do we do about this. Well the answer is fairly simple. This is a mechanical problem and we must treat this mechanically. This means exercise but it is NOT just any exercise. In fact if you do the wrong exercises you can make matters worse. Physical therapists (PTs) are your best friends when trying to address this problem. Now, most PTs would initiate a course of exercises to strengthen and re-balance the musculature of the hip and thigh which will in turn correct or re-balance the muscle pull on the patellofemoral joint which will alleviate the stress to the knee and help reduce pain. This is all well and good. But recent research suggests that hip and thigh exercises along with Core strengthening exercises are even better. Basically these core exercises enhance the control of the musculature around the hip and trunk which not only helps to reduce the knee pain but also improves the function of patients better than and for a greater period of time that standard thigh strengthening alone. Again, you cannot simply do any random core exercises and you may need some guidance. Click here to view some sample exercises, but if you need a greater level of 1:1 attention please do not hesitate to contact our office.